SC Privacy Judgement - What does it mean to you and me? 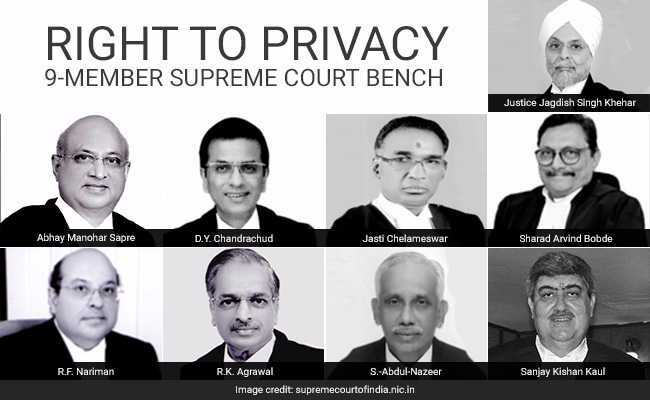 In a landmark privacy judgement yesterday, the Supreme Court said that privacy is a CONSTITUTIONAL right. Nine judges were unanimous in their finding, though they cited different reasons for their conclusion. The judges concluded today, “The right to privacy is protected as an intrinsic part of the right to life and personal liberty under Article 21 and as a part of the freedoms guaranteed by Part III of the Constitution“. On the face of it, the judgement is not a big deal, but a huge deal. It means, we are entitled to our privacy. In reality, this is the much needed first step, not much will change immediately for us. In an ideal world, Aadhar is the best tool to solve a lot of India’s financial and social challenges. However, the key concern is the safely of all the data linked to Aadhar. I just found out that my electric power company (a government owned entity) now has my mobile number. (They text me when there is a power outage, after the fact of course.) The mobile number is linked to my Aadhar. So, now the government knows how much electricity I consume. While there is nothing wrong with it, I am afraid that this data can be misused in many different ways. Now the government not only tracks what I earn, but how I spend it too. With Aadhar-PAN-Mobile-Credit Cards-Bank accounts-Taxes linkage, the government has a huge data mine. If the government uses this data for the betterment of the country, nothing like it. But we are so used to the abuse of power by government officials, that a chill runs thru my spine knowing that all this information is now so readily available. While there is no direct impact on the usage of Aadhar, it now clear the way for the Aadhaar hearings to resume under a smaller three-judge or five-judge bench. Until then, the government will maintain status quo on the mandatory usage of Aadhar. According to legal experts, the true test of a fundamental right to privacy will be when it is applied in specific legal cases. Aadhar is one of them. It will slow down the government on going full steam ahead on projects that may raise privacy concerns. It will prevent governments to conduct very intrusive surveys like the one performed by the government of Telangana when they came into power. They obtained every conceivable information you can think of. No one heard of what happed to that data or how it is, it at all, it is being used. This verdict overrules several verdicts from the past. There is a possibility of new legislation that imposes regulatory liabilities on government and private players who collect privacy related data.